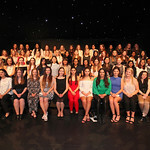 Our Year 13 girls attended their awards ceremony held in 'the space' for the first time. It was a lovely occasion, happy and sad at the same time as they prepared to leave us, but celebrated their amazing time here with their friends, families and staff. Well done girls and thank you for being you!